Residents of Chinoe Creek Apartments! 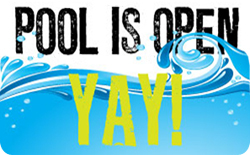 Our sparkling pool is now open and the warmer weather has finally arrived! We love keeping our residents happy so tell your friends and neighbors to come cool off in our swimming pool or catch some rays on our sun deck. See you all poolside!